Wild West End from Dire Straits’ first album has always been one of my all-time favourite songs, so it is no wonder that it is one of the songs I recently started to practice a bit. Of course you will never come to a point where you think that you really can play it (at least not the way you feel it should be played like), but a few days ago I nevertheless recorded and filmed me playing this song, to capture its current state so to say (see video below). I played the lead guitar together with the vocals live in one take, over a self-produced backing track (available here). Here is a “little secret” about the way I filmed the video (before some Sherlock Holmes might notice it anyway): As I have only one camcorder, I cannot film different views simultaneously. 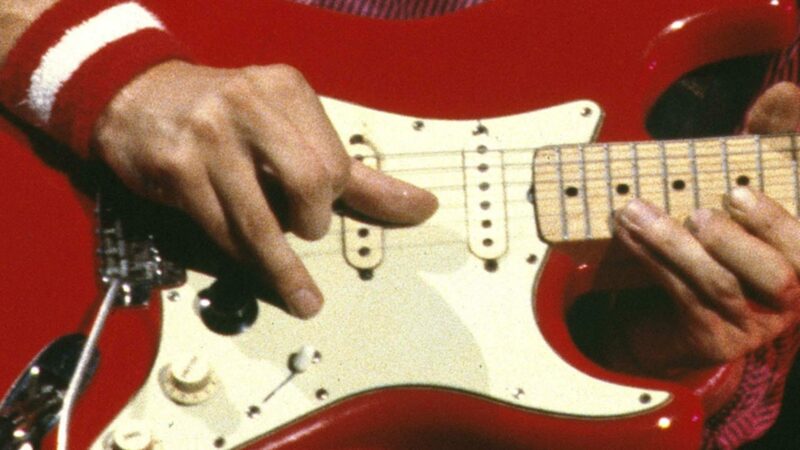 For this reason I mimic’ed the lead guitar in a second take for the close-up scenes (I thought some of you might like to see some details what the fingers are doing). Same for the rhythm guitar which I did not film when recording it for the backing track (it was in fact the same guitar shown here, a beautiful blonde Fender Telecaster). The lead guitar is a US Fender Vintage Stratocaster ’62 which lost its finish some years ago – played into a Music Man 212 HD 130, mic’ed with a Shure SM 57. Effects are a Morley volume pedal and the green MXR analog delay. I added some EQ’ing, a limiter (!) and some reverb in the mix (the reverb of the Music Man was also on). That long stereo echo at the end of the intro was also from the desk (the “desk” and the effects are all software in my case). The rhythm guitar was tuned to Open A and capo’ed at the 5th fret (thus open D). I played it directly into the desk and added a bit of EQ and reverb. As said, it is a wonderful Telecaster, played with both pick-ups on, all controls up. But now, here is the video, I hope you will enjoy it. Best DS cover i`ve ever heard – really well done! Absolutely perfect, very well done! May I ask what kind of tool you are useing to mix the HD Video and the Backing track together ? I recorded the audio with Cubase, without any sync to the camera. Then I simply put the mixed audio on a separate audio track in premiere and moved it around so that the wave forms of the audio from the camera and the audio from Cubase match visually. I found tiny differences of a few milliseconds do not matter at all, also the sync does hardly drift over even a few minutes, it is quite easy actually. Shame that Mark didn’t play the end solo, e.g. on the sunburst strat in a TOL-sound-like, it could have been wonderful. Wow Ingo that’s simply beautiful and your touch is so soulful and heart felt unreal!! well done mate! Great job Ingo. Beautiful feel. was this guitar your red strat at one point ingo ? No, this guitar lost its (non-original) finish many years ago. The guitar is original except laquer, pickguard, and one pickup. Fantastic! That song cover soothed my ears. I loved the sound of the guitar as well, very clean. Thanks for sharing this post to us. I enjoyed reading it. Please excuse if asking stupid questions but what is the original tuning of the National on the song ? Chords would be good too. Got it in my head it was Open G Capo 6 ? Great job. I picked up the Dire Straits album in 1987. I remember the year well. It’s the year I went on vacation to Barbados. I had been given a copy of Alchemy and wanted to hear more. There were 3 tracks that stuck out. Sultans of Swing, of course, Lions and Wild West End. I would love it if you could do some sort of video lesson and/or tab for the original recording. I also left a comment on your youtube video. Anybody seen this Brazilian playing the sultans swing !? It’s amazing and I wonder what Mark Knofler has to say about this Brazilian musician who plays in the streets of the city center of São Paulo-Brazil … Here in Brazil the dream of this musician is one day to mark knofler know and who knows make a sound together! That would be really amazing!